Hello mortals! Because I have been asked several times already if I have those Mooman's stuff, Tech Buildings which are available to public, I decided to upload it here. So, you have here Tech Armory, Tech research Center, tech Communications Center and Tech Police Station, as well as rules and art files as examples. Credit goes to Mooman of course. Good for new tech buildings. It takes me a while to think what functionalities they should have. Thank you good people. I am glad that people still find it useful. You are right, especially the last 2 buildings in your post, are they scrapped tech buildings from ra2? I think that everything is scrapped from original game files. That tech satellite just got flag, it completely exist in game as random building. It did not have snow on snow version, as result is this does not have as well. Tech Armoy is being scrapped from various tent buildings plus flag and fireplace. 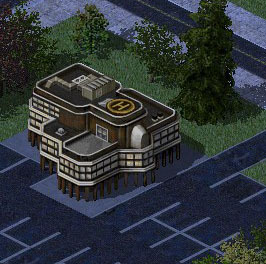 And those two you asked, yes, they exist somewhere in game's file as unused buildings. I think they are in different palettes as well. The 3rd one is city04.shp in one of the mixs of RA2. This is a modified version with remap color. The 4th one is a heavily modified version of city03.shp, I only realized this after checked the file itself again, as the shape of these two buildings are the same. There are also c*city*.shp files, however there is no theater difference between them. Note that all these files uses city*.pal palettes, not the normally used unit palettes. I noticed something strange with the 3rd building "city04.shp", the building reflection shows it was rendered in a snow area, same goes to buildings with tesla orbs, did anyone notice this? PussyPuss, Hmm... I did not pay attention, but nice discover. G-E, WHOA That is epic work! I like it! What are you using this building for? Rehab/physio center... medical but not surgical.